Tiddlywinks: Level 80 and More! Quite a busy day yesterday. First and foremost, ding 80! It all started yesterday as I cleaned up the final quests in the Sholazar Basin. I had only about 30 more to do and quickly earned my Into the Basin achievement. But while completing my Sholazar Quests, another achievement I had been traking for a while finally popped up - I am now Tiddlywinks the Seeker! 3,000 quests completed (which also pushed me over 3,000 achievement points). After 3,000 quests and the Basin complete, I headed for the Storm Peaks. 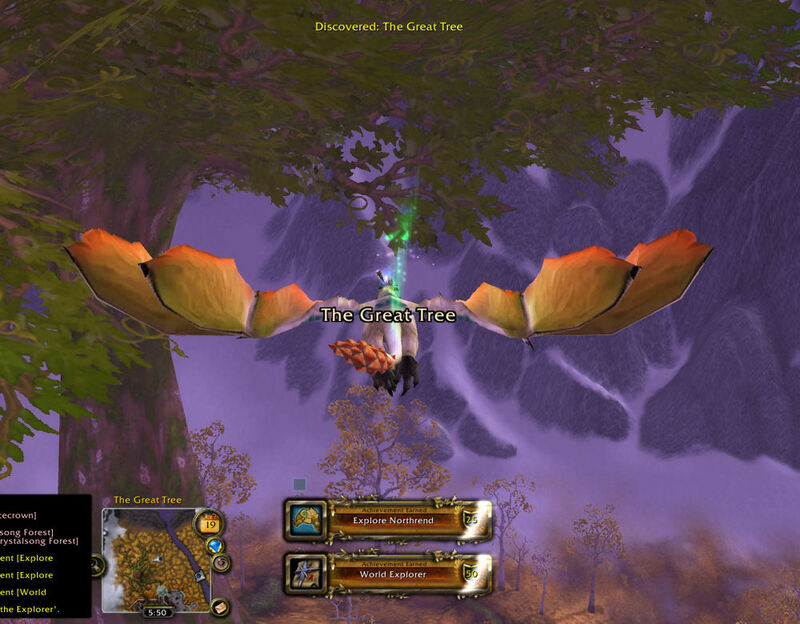 K3 was my next destination and after questing there for a while, earning the vaunted Mine Sweeper achievement, and having some fun up in the sky and the mountains, I hit 80. So what to do next? Well continue questing of course. I'm going to finish off the Storm Peaks and then move to Ice Crown to get my Loremaster of Northrend achievement (unfortunately, Kalimdor remains unconquered). 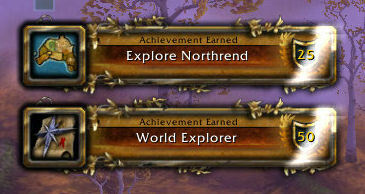 But after questing a little longer, I decided to go explore, and earned the title of The Explorer! So now what? 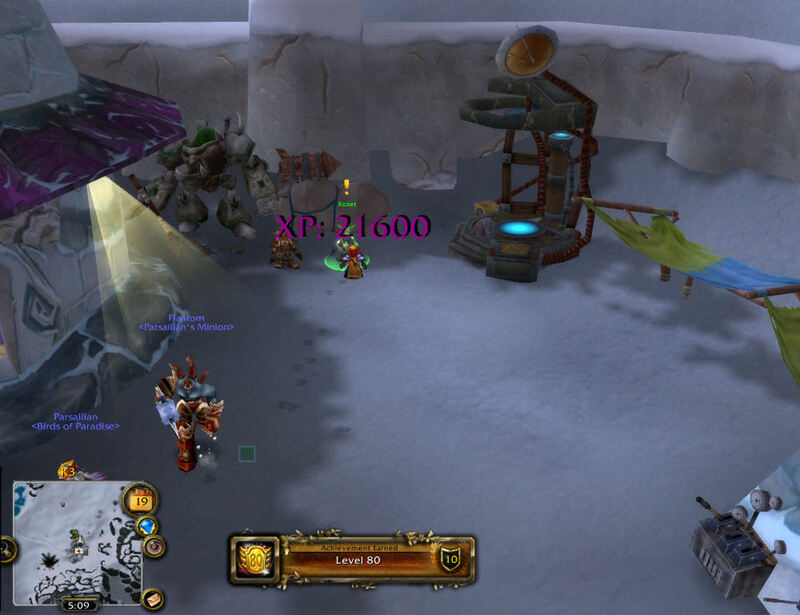 Well bright and early this morning, I earned my 10th Dalaran Cooking Award, and I have much reputation to grind with certain factions that reward pets. I also need just one more reputation at exalted to earn 25 Exalted Reputations and of course, I'm fishing for my Giant Sewer Rat and also for the coins in the fountain. I also put of leveling engineering this whole time, but with stacks of cobalt going for 100g each right now, getting my engineering up will take quite a while when I finally decide the market has stabilized. However, I did raise First Aid to 450. Enchanting sits at 410, cooking at 415ish, and fishing at around 395. Last night with my Tabard of the Explorer, I also received my Tabard of the Achiever for having 25 Tabards. There's so much more to do, so many more quests to complete, so many more achievements to seek out. I think I'll head back to the Storm Peaks tonight, fish a bit, and try and finish up the Oracles questline so I can start earning rep with them.